André Rickert has undergone his initial apprenticeship at Thomas Bühner when the latter was still cooking in Dortmund. In the following years he became an Amador disciple, lately being part of Caro Baum’s team at the formidable Amesa in Mannheim. His cooking or better plating clearly speaks the Amador ‘language’ in that dishes are plated in a modern, precise and transparent manner to let the main product be in focus whereas all other ingredients are perfectly proportioned and balanced. 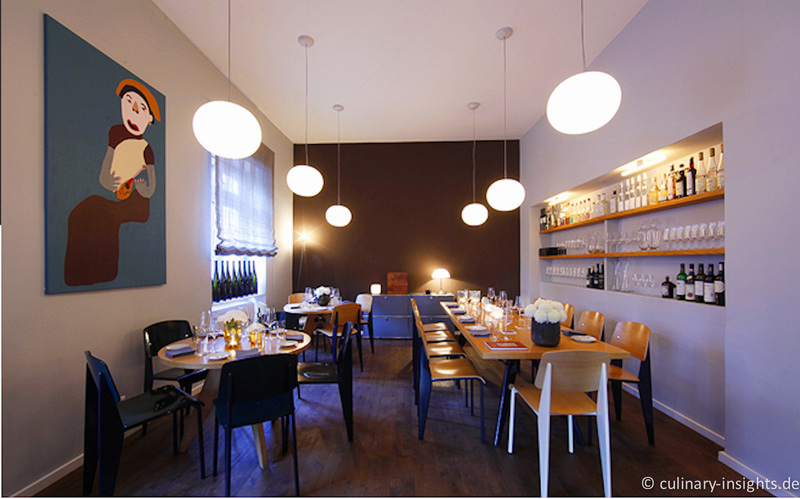 Clearly, in a bistro-style ambiance like Weinsinn one cannot serve cutting high-end dishes like at Amador or Amesa but he comprises only to some extent and most visitors are pleasantly surprised to see such a modern cuisine in a wine bar. …and the second the “restaurant”. Now, it’s one concept whereas I like the second room more. Bistro-atmosphere, no table cloth and unpretentious but diligent service completes the overall picture of a real fun place to meet friends, discuss food, enjoy excellent wines and delicate modern dishes. We let André cook for us so that we were relieved from having to choose from the menu card. The dance began with a nice tortilla nibble, intense, light and not too dense as we often encounter for this traditional potato omelet – followed by luke-warm potato salad with cucumber and baked chicken (‘Backhendl’) – again a light version of a traditionally heavy savory dish. Very good. 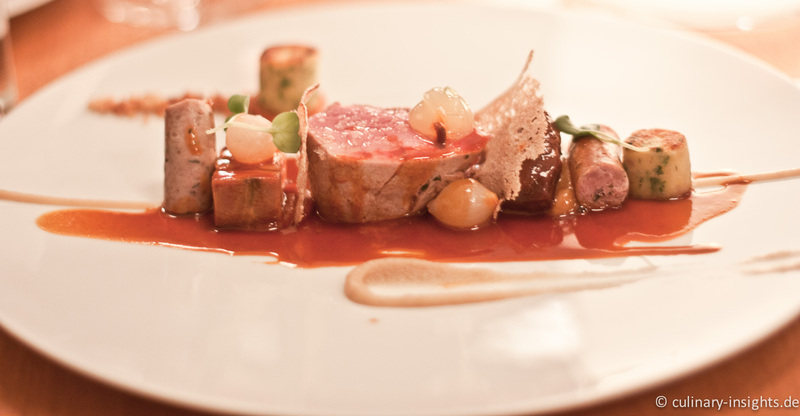 Tataaaa: the first course, marinated veal with celery and truffles vinaigrette was a joyful, spot-on starter emphasizing first and foremost the product character of the veal that was marinated to add some acidity enabling it to counter the other ingredients. This seemingly simple dish clearly showed the potential of Mr Rickert as it was very well thought-through and perfectly executed: celery in textures brought earthiness and a slightly hot acidity, the truffles vinaigrette (with real truffles of a quality solid enough to achieve a truffles effect) being rich and creamy, reduced and exactly dimensioned in the right proportion and, last but not least, some herbal jus of the parsley (I guess) to balance out the dish. In essence, this appeared like a light salad despite the normally rather heavy ingredients. Very good to excellent. The next course was the star of the night: the lukewarm cod was impeccably cooked at low temperature (without having a fancy Julabo at hand in the kitchen) and met ingeniously with structures of apple, soy jelly, an wasabi ice cream (with exactly the right and thus non-dominating amount of wasabi). 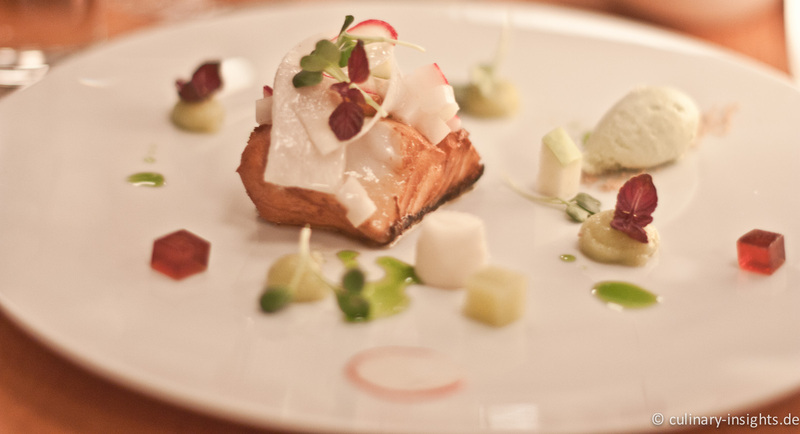 The trick here was the interplay of the different temperatures and textures with the cod being accentuated by slices of apple and small cubes of radish. Again, Rickert was able to shield the character of the main protagonist (by the topping and nice roast flavors) but at the same time was able to pair it with the wasabi and soy as if this would be the most normal thing in the world. Many starred restaurants could be proud if they would be able to serve such a delicate and compelling combination. Excellent to outstanding! 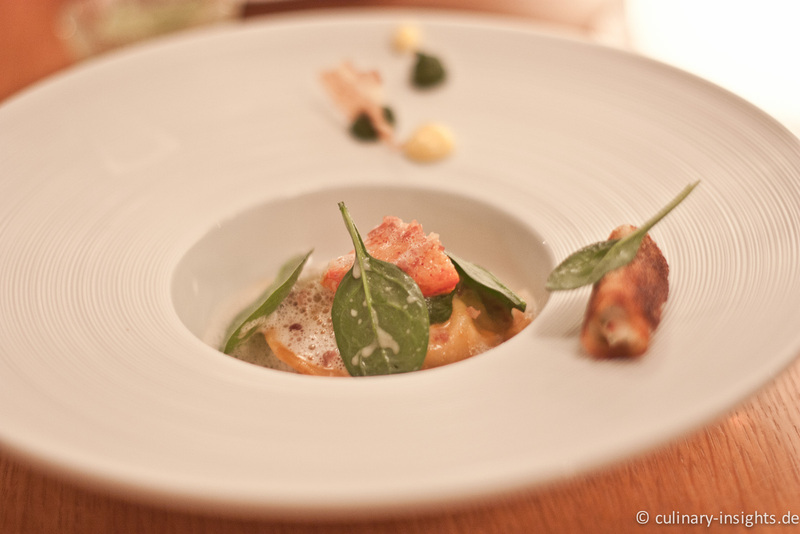 The lobster raviolo was a big yummy species with a thin but not too thin dough and some lobster pieces as ‘garnish’. The carbonara (egg, bacon and cream) combination worked out surprisingly well and didn’t cause us to waive the white flag due to over-stuffing. Very good. More traditional on first sight, the loup came perfectly cooked with herbal leek puree, potato/leek mash and a pointed mustard jus that did the little extra to this creation. 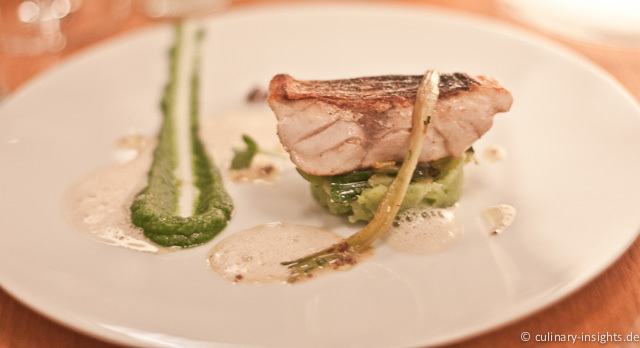 Key was the formidable fish, perfect execution and the dialogue of herbal and acid notes. Very good to excellent! What a main: with a deep bow to the usually so underestimated pork (besides the now so fashionable Spanish Black Feet or Acon porks) Rickert presented a formidable parade of different pork pieces from sausage, back, loin and shoulder in combination with a simple slightly sweet, rich and spicy bell pepper sauce emphasizing the rustic character of the pork and playing yin and yang with the onions (nice repercussion of the sweetness of the bell pepper yet in a different tone). Excellent! After a splendid pre-dessert (a compote of exotic fruits), the main dessert reminded a bit of Christian Baus chocolate/peanut combinations… A perfect closure to a formidable meal, although we really felt full at the time as the portions had not been that reduced versus the normal à la carte ‘weight’. Very good. Let’s recapitulate: two men in the kitchen, a 5+1 course dinner at 59€, an extensive and very reasonably priced wine list, unpretentious and knowledgable service – how can one not go here in a city of daylight robbery where prices have sky-rocketed due to the target audience of expense account fiddlers?? 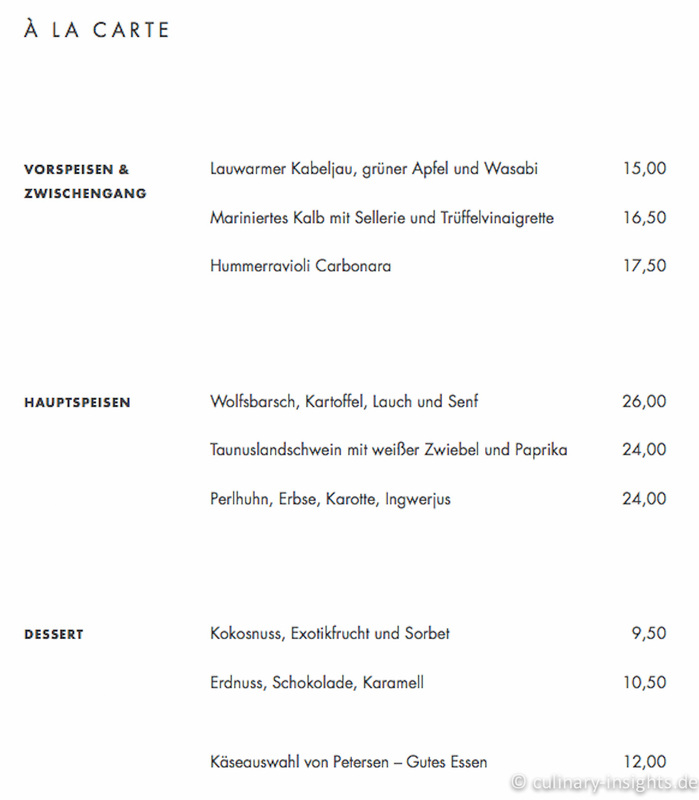 To put this performance into perspective (and I have not eaten there several times): André Rickert is already among the best chefs in town, only overtaken by Patrick Bittner and Mario Lohninger. And that is at about half the price of Ernos Bistro, Villa Merton and the like. A nearly always fully booked restaurant tells the same story, many of the diners being pleasantly surprised about the quality of food, presentation and fun factor. From an international perspective (and this is why I am writing this in English), Weinsinn is good and bad news as it shows that there is at least one example of bistronomics in Germany, but that is ridiculous in the end. 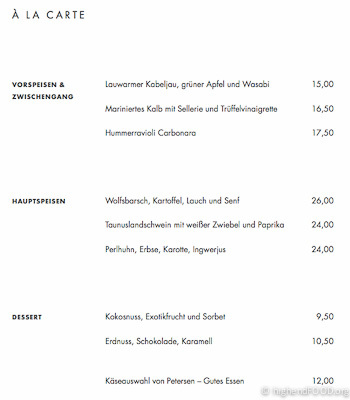 In times where fine dining still suffers from the aftermath of the economic crisis, there must be room for such concepts such that, finally, something like a culinary “Mittelstand” will be established in Germany. Which is, in turn, very important for the top notch places as it introduces younger diners to more ambitious concepts and then will also potentially cause some spill-overs to the starred end of gastronomy! I can only wish that André Rickert will keep that very high level and continue to delight us with his unconventional and thought-provoking but nevertheless delicious cuisine at very reasonable prices. So indeed, a fooding place not only for foodies! This entry was posted in Europe, Frankfurt Files, Germany - Fine Dining, Weinsinn and tagged André Rickert, Caro Baum, Frankfurt, Frankfurt Files, Juan Amador, Weinsinn by IFS. Bookmark the permalink. a delightful meal or just a glas of wine. Looks phantastic. 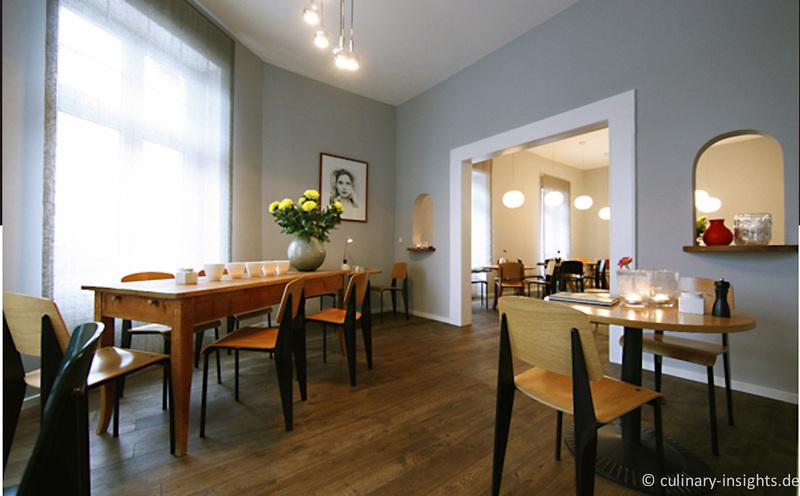 Question – it promotes itself as Restaurant/Weinbar. Is there a Bar area? I do not see anything on the photos. Offenbach ist Inspiration für mich! Seit 1 Jahr arbeite ich dort und ich liebe die Brüche, die Reibung, die in OF am Meer zu spüren sind. Vom Schaumahl hörte ich schon öfter, da muss ich wohl mal vorbei (nachdem die einzige Perle in Wiesbaden, das Maloiseau, seit Montag geschlossen hat).